Each year, HP employees around the world volunteer in their local communities, with support from HP, which offers every employee four paid volunteer hours each month. 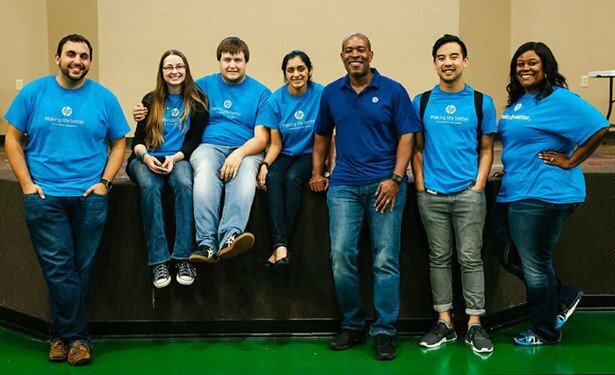 This year the HP Foundation invited employees to volunteer with their colleagues to support causes that are close to their homes — and hearts — as part of its 40 Days of Doing Good campaign. This year, employees volunteered more than 6,800 hours during 77 events in 15 countries to support the campaign. The following stories highlight just some of the inspiring projects that took place around the world. When Ida Aladjem, an HR business partner at HP Bulgaria’s Sofia site, heard about Tikkun Olam Makers (TOM), the organization’s mission struck a chord. TOM creates affordable open-source solutions that make life easier for people with special needs. It brings together makers (engineers, innovators, and problem solvers) and need-knowers (people with a deep understanding of a specific disability challenge) for 72-hour problem-solving Makeathons. “It felt great to be able to support an initiative where you can get to know a different community with different challenges and where you learn and work together to create an impact,” Aladjem said. Aladjem brought together HP volunteers to help run TOM’s first European Makeathon. 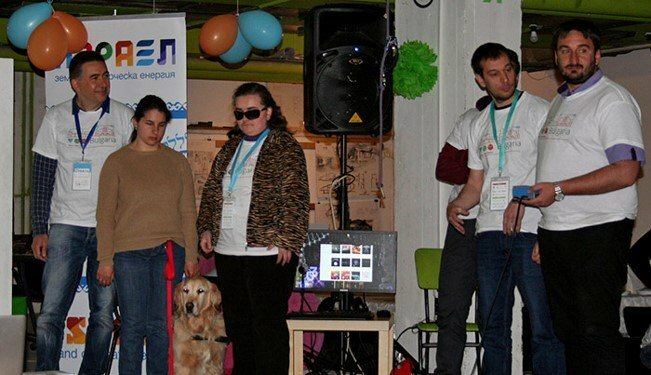 Stilyan Mitrev, Yanitsa Bekyarova, Alexander Bekyarov, and Ida managed logistics, and software engineer Antony Gruev represented HP as part of the Makers team. The Makers team was assigned six challenges. One was to find a solution that would help blind people recognize bank notes with worn braille imprints. Antony and his team of makers developed a small device that uses image recognition software to audibly indicate a note’s value. When the Makeathon came to a close, the teams had developed working prototypes for all the challenges. Vision Now collaborates with other organizations to provide mentorship and hands-on learning experiences for underrepresented youth in the U.S. 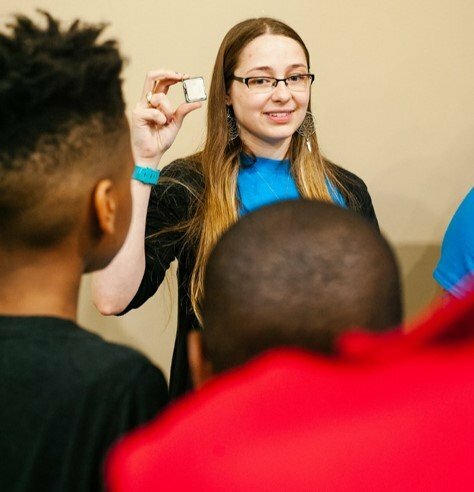 When Leslie Gaines, a Business Operations manager in HP’s Personal Systems organization, heard that Vision Now was at risk of cancelling a local workshop for 40 boys in Houston, he stepped forward. With the help of his wife, Shawana Gaines, who also works for HP in its IT organization, Gaines recruited other local HP employees to bring the workshop to life: Karuna Rupani, Huy Tu, Mary Kate Howard, Michael Howard, and Ted Raad. The team developed activities to show the boys the value of a STEM education and to inspire them to continue their learning. Choosing an organization for 40 Days of Doing Good wasn’t difficult for one India team. Through its Hour of Code volunteer program, a team in India connected with local schools that are working with Careworks Foundation (CWF), a nonprofit organization focused on education development and healthcare. For the project, HP employees planned and delivered lessons to 60 nine- and 10-year- old students at the AGARA Primary School in Bengaluru. The lessons covered spoken English, grammar, spelling, basic math, and coding. Each HP volunteer led small learning groups to make sure students got the attention and support they needed—which isn’t always possible in otherwise large classes. The best part of the project for the HP employees was realizing that the students were enjoying themselves. “Knowing that the kids look forward to our visits to school is a wonderful feeling,” R.V. said. Although the project was developed to support 40 Days of Doing Good, it will live on after the campaign. HP volunteers in Bengaluru are continuing to work with students on the vital academic and IT skills they need to secure a successful future.